Her name is Gratitude and she lives and works in Bas-Congo, a neighbouring province of Kinshasa in DR Congo. 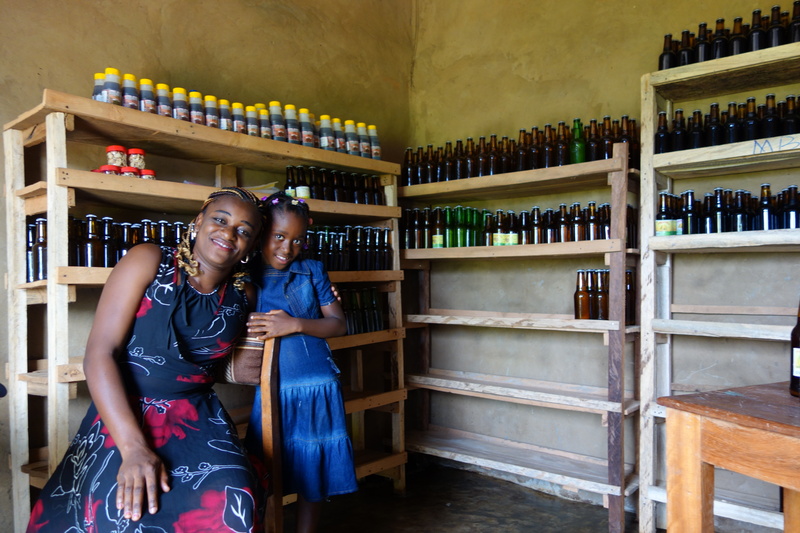 Six years ago she started her own microenterprise CETRAPAL – Centre for the Transformation of Local Food Products – on the basis of a very simple idea: turning unharvested fruit like mango, oranges and passion fruit into quality juices, while using honey as a sweetener and using maize in beer. So she creates an added-value to the raw materials of the fertile Congolese soils. As such she transcends a life of subsistance farming that consists of sowing and producing manioc, rice and vegetables for survival and selling small amounts on the local market. This enthusiastic woman studied food processing technology at the Kongo University campus in Kisantu. She actually employs a score of women to clean, cut, bottle and sterilize the fruit. She wants to stimulate the start-up of small transformation companies in other villages of Bas-Congo as well. For the moment she caters for the city of Kisantu, but her ambition is to produce and reach the market of Kinshasa, and why not, the world-wide market outside Congo. The sky is the limit. Gratitude is a kind of person that Congo really needs: an educated female entrepreneur with a long-term vision, with innovative but very simple and realistic ideas. Gratitude believes in the power of education too: she opens her company for internships for students of neighbouring technical agricultural schools and acts as a role model in these schools. As such we may hope with her that new enthusiastic female entrepreneurs will follow in her pioneering footsteps. And yes, the products of the “terroir de Kisantu” taste delicious, like the Kombucha juice that I personaly qualify “best of the world”. Resignation becomes hope in this small company in a remote corner of the Congolese countryside. Thumbs and heads up.